I donâ€™t know about you but for me, there is something about cigars that make you feel so much better about yourself. When smoking a cigar, it is not only about the flavor â€“ it is the whole experience. And sometimes, I find myself fantasizing about my wildest dreams. One time I am big Mafioso like Tony Soprano. Another time, I might be a suave spy like James Bond. 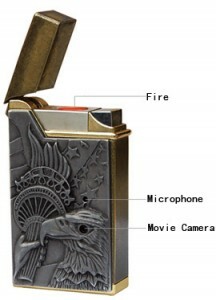 And speaking of espionage, I found this really cool lighter that can add to your spy fantasies. Dubbed the Lighter Camera Lighter DVR Hidden Digital Video Recorder with Micro Camera â€“ yeah I know, the name kinda takes some of the coolness away â€“ this baby doubles as a lighter AND a hidden camera. I can just imagine leaving the lighter on a desk, a coffee table, or some other non-intrusive place in the house and then checking on the video recording later on. Not that I would find anything interesting â€“ I highly doubt it â€“ but the mere idea of having the capability of recording things appeals to my espionage senses. â€¢	Normal Lighter look makes it ideal for a variety of surveillance uses. â€¢	Itâ€™s great for use as a hidden camera, spy cam etc. â€¢	Color video with voice lets you clearly see whoâ€™s there & hear what they say. â€¢	Thereâ€™s no long cord for you to hide or Wireless frequency to detect. As you may have noticed, I have recently acquired an interest in cigar box guitars. While I have heard of them before, I didnâ€™t really pay much attention to them. I have only begun to appreciate the art involved in making these guitars. Will Sluetal, on the other hand, has been at it for quite some time. He is from Grand Haven, Michigan, and claims that he can make an excellent musical instrument given four hours and a whole lot of passion and talent. I must say, his work supports his claim. Sluetalâ€™s day job is the chief mechanic of the Grand Haven Department of Public Works. 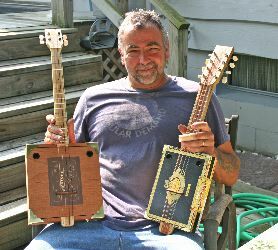 The skills that are integral to his day job are carried over to his passion, the creation of a wide variety of musical instruments from guitar boxes. Guitars, ukeleles, madolins, drums, and other â€œunnamedâ€ instruments â€“ these are only some of Sluetalâ€™s works of art. Oh, and everything he creates is electric. So does this mean that he is an avid cigar smoker? Well, he does smoke but he does not have to spend a fortune in cigars to obtain all the boxes that he needs and wants. He does have the smarts. What Sluetal did â€“ and does – was to make guitars for the presidents of cigar companies. He gave these as gifts and he has been amply compensated with all the empty cigar boxes that he needs. If you want one of his works, you can visit Elderly Instruments in Lansing and Surroundings in Manistee. Make sure you have about $125!